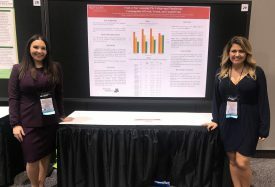 Share the post "IFNH Student Ambassadors Present Research at National Conference in Chicago"
On October 21, the student ambassadors of the New Jersey Institute for Food, Nutrition, and Health (IFNH) flew to Chicago to attend the four-day Food & Nutrition Conference & Expo (FNCE). 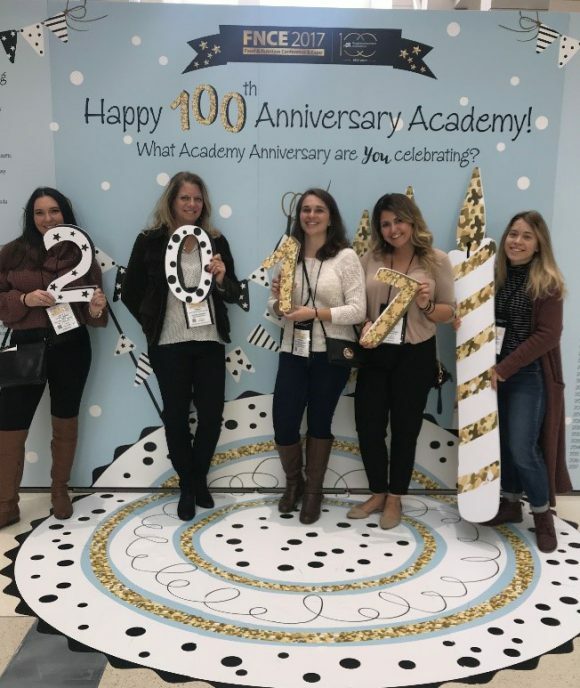 The Academy of Nutrition and Dietetics celebrated its 100th anniversary in Chicago, Illinois, where more than 16,000 registered dietitian nutritionists, nutrition science researchers, policy makers, health-care providers and industry leaders attended the annual conference. IFNH provided funding for the student ambassadors, Brenda Borba, Chelsea Cotugno, Carly Harris and Sofia Zois, to attend FNCE and present their research to various healthcare professionals. 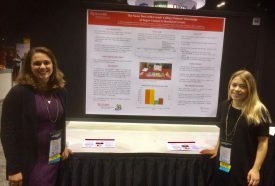 Borba and Cotugno presented, The Sweet Deal with Cereal: College Students’ Knowledge of Sugar Content in Breakfast Cereals, which was inspired by the average American’s over-consumption of sugar, leading them to investigate whether college students were able to accurately rank cold breakfast cereals in terms of sugar content. Harris and Zois presented, Fruit or Foe: Assessing the College-Aged Populations’ Consumption of Fresh, Frozen, and Canned Fruit, which compared students’ perceptions on the nutrition content, deliciousness, convenience and healthfulness of fresh, frozen and canned fruit in hopes of increasing total fruit consumption in college populations. This year’s conference was full of inspirational speakers such as Sanjay Gupta, who is a practicing neurosurgeon and reports on health and medical news for CNN; Kimbal Musk, who is the co-founder of farm-to-table The Kitchen; and Michio Kaku, a theoretical physicist who is one of the most widely-recognized figures in science in the world today. The student ambassadors were able to attend these speaker presentations, as well as various advanced-level educational sessions on topics ranging from the latest nutrition research to public health policies.